Profile > Financial > Dashboard shows an overview of the student's financial information—including invoices, payments, transactions, deposits, and tax forms. The Profile > Financial view also includes sections for term-based financial info, financial aid applications and awards, and donations. Here are the actions you can perform on the dashboard. Some of these are only available to use under certain circumstances—for example, if the student doesn't have a credit balance, you cannot use the Refund Credit Balance action. Apply Financial Lock: During a financial lock, the student cannot be registered for Courses by anyone, nor will he be able to see his grades or transcript. Read more about locks on student accounts. Invoice Pending: Read about invoicing charges here. Print Statement: This creates a PDF showing all of the student's outstanding invoices and/or unapplied payments and credits. Record Payment: This lets you record a non-Financial Aid payment. Read about recording payments here. Refund Credit Balance: If the student has a credit balance, this option lets you refund it. Read about refunding credit balances in this article. Pending Fees have not yet been invoiced. At this point, you can still edit or delete them—but once they're invoiced, they'll be part of the permanent record. 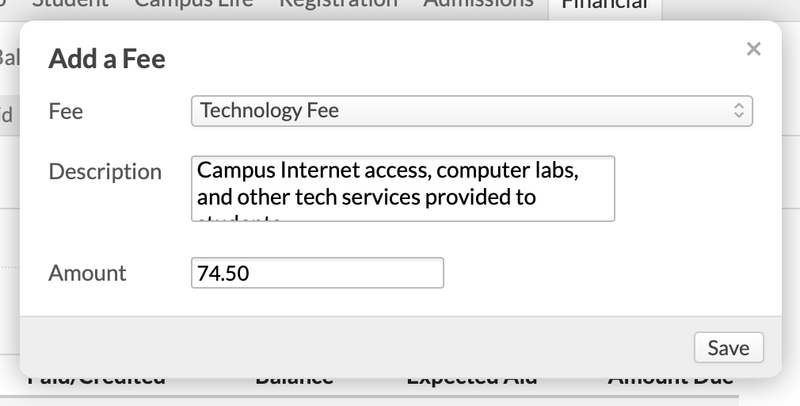 Some of these fees may have been added by a Campus Life user (or triggered by a Campus Life action). Such fees can be edited or deleted on the Campus Life view, but can only be invoiced here on the Dashboard. Enter or edit the amount. Click to edit or delete a fee. You can only edit while the fee is still pending; once you invoice it, you can't make any changes! Click an Invoice # to view that invoice's page. If the student has any unapplied payments or invoice credits, you'll see them here. Click the reference # to view the payment's transaction details. Click Apply to use the payment or credit. This works just like recording a payment. This panel shows the 20 most recent transactions that affect the student's account. You can see a complete transaction history in the History view. The summary can show you any and all of the following information—provided it's there to show. If, for example, the student doesn't have any unapplied credits, that line will be absent from the summary. 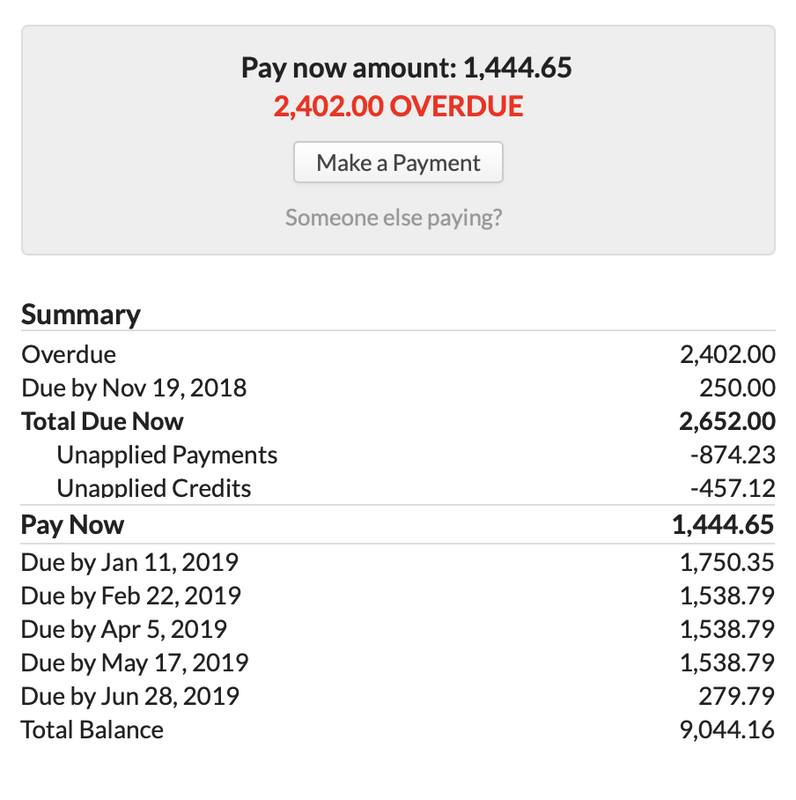 Overdue: The sum of all the student's unpaid charges on invoices whose due date has already passed. Due by: Any amounts coming due within the time period specified in your Pay Now Cutoff. Due by: Amounts due beyond anything factored into the Pay Now amount. This includes payment deadlines for payment plans and invoice due dates beyond the Pay Now cutoff. These amounts may be affected by any scheduled aid disbursements that have been attached to specific invoices. Total Balance: The sum of all the student's unpaid invoiced charges together with unapplied payments/credits; it excludes any expected aid. This article has a thing or two to say about paying down student balances. If you have enabled online payments, you'll see the Make a Payment button. Click that to go to the Pay Now page, where you can see details of all the charges, enter payment details, and even set up a recurring payment (if enabled). Your students will see these same options when making a payment. Click Someone else paying? to get a link to the Pay Now page that you can copy and send to a third-party payer. Payment plans on the Dashboard view can capture any of the student's plan-eligible invoices. Read more about adding and using payment plans. The default tuition schedule determines how Populi will apply tuition charges to this student when he enrolls in a course. While you can manually-add a default schedule here, this item is typically inherited from the student's academic program (which itself can be inherited from the application). This article describes how to automatically add default tuition schedules to your students. A student can have multiple default tuition schedules. Click Add a default tuition schedule. Select a schedule from the drop-down. Repeat these steps for as many tuition schedules as you wish to add. When the student enrolls, this schedule will trigger tuition charges (and any fees that depend on this schedule). To see the particulars of the tuition charges, you'll need to look in the By Term view. If you've added any deposits to the student's account, you'll find them all here. Read more about processing deposits for the complete workflow. When you release 1098-T's to your students, you can come here to download the student's individual Copy B form. By default, 1098-Ts are enabled for all students. However, IRS rules don't require that every student receive a 1098-T. If you'd rather Populi didn't generate a 1098-T for the student, click Disable. Students at Canadian schools can download PDF copies of their T2202A and/or T4A forms. If you're using one of the per student options for enrollment agreements, you'll find the agreement record here. If using the Per student, not required option, then you can upload an agreement generated elsewhere. You can mark whether or not it has been signed. If using the Per student, required once option, Populi will generate the agreement the first time the student registers for courses on Profile > Registration. Delete an agreement by clicking . If you're using the required once option, a new agreement will be generated the next time the student registers for courses on Profile > Registration. If you've enabled recurring payments, then the student and third-party payers can set up recurring payments on this student's account. 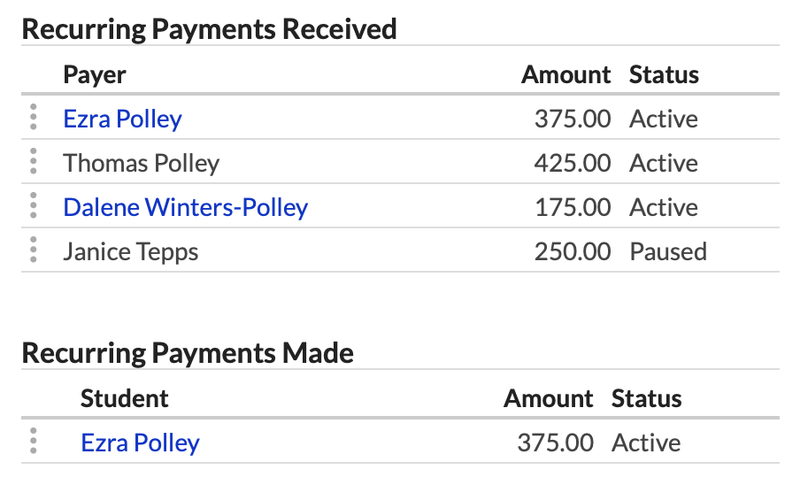 These two panels show all recurring payments that have been received on behalf of the student, and any recurring payments the student has set up. Resend management link email: Email the payer a link to the page where they can make changes to the recurring payment and review the history.